Lumber Liquidators has halted sales of controversial flooring made in China. Lumber Liquidators has halted sales of controversial laminate flooring from China after a spate of bad publicity, plunging sales and government probes of the product. The company disclosed last week that is facing the possibility of criminal charges from the Justice Department over imports of the flooring. The Consumer Product Safety Commission had previously disclosed its own probe into the possible health effects of the flooring. The concerns about whether the flooring had dangerous levels of the cancer-causing chemical formaldehyde first surfaced on a report on 60 Minutes by CNN anchor Anderson Cooper. Even as it was announcing the suspension of the flooring sale, Lumber Liquidators released results of air tests that it says showed 97% of more than 2,600 homes with the flooring were within safety levels set by the World Health Organization. It said it would work with the 3% of homeowners whose flooring failed the tests. "Despite the initial positive air quality testing results we have received, we believe it is the right decision to suspend the sale of these products," said Robert Lynch, CEO of the company. "We will work diligently to meet the needs of our customers and to ensure their satisfaction." The company reported last week that sales plunged 18% in March compared to a year earlier following the 60 Minutes report, after being up the first two months of the year. The sales hit was a key reason the company posted a net loss of $7.8 million in the first three months of the year, compared to a $13.7 million profit a year earlier. California has stricter standards than does the WHO, and the Chinese flooring has been accused of violating those state standards. There are no national U.S. standards for formaldehyde. Lynch said the company's Chinese supplier had certified and labeled the flooring as compliant with the California standards, but that the company is now "reviewing the underlying certification and labeling processes and practices of its suppliers." 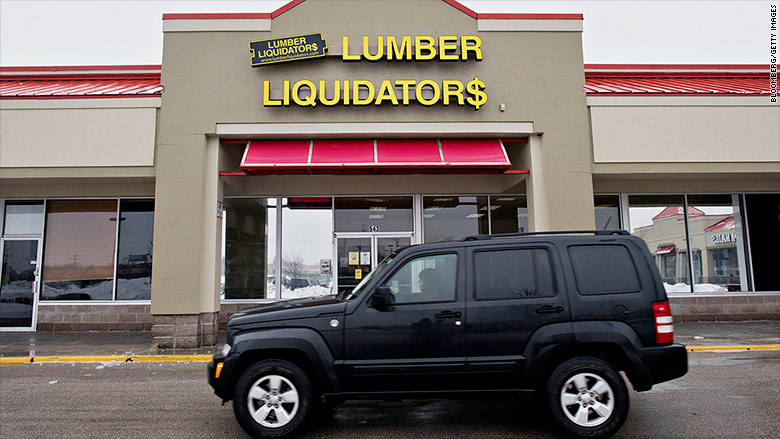 Shares of Lumber Liquidators (LL) stock were slightly higher in premarket trading following Thursday's announcement.